Ride the G: to Cavill Avenue Station . A very special visitor will be making her way from the ocean to Circle on Cavill on Tuesday, February 12 and Tuesday, February 19! 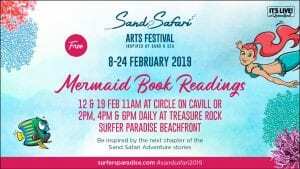 Heidi the mermaid will be visiting us for a special mermaid reading at 11am as part of the Sand Safari Arts Festival so make sure to bring the kids over to Treasure Rock to enjoy a magical morning. Children will also have the opportunity to get crafty at the Sand Art Sessions where they’ll have the chance to make their own sand art cards utilising a rainbow of coloured sand. The session will take place on Tuesday, February 12 from 11.30am – 3.30pm. With so much on offer, families are invited to come into the precinct for a day of fun while making the most of the free entertainment and food and beverage options the Circle on Cavill Centre provide. Parking is available at Circle on Cavill with entry and exit available on the Gold Coast Highway and Cavill Avenue. The first two hours of parking is free upon presentation of a receipt for $20.00 or more from any Circle on Cavill retailer.